race, remained to the Empire. 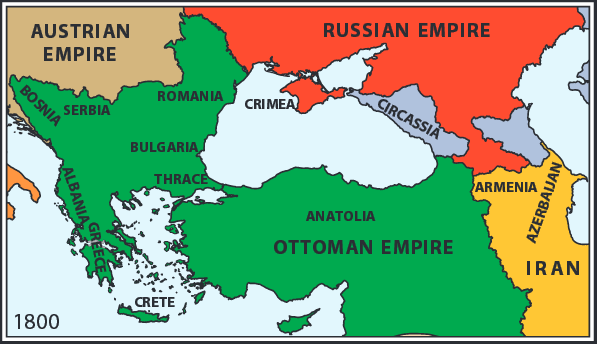 the occupied territories for the Ottoman Empire. By the time Greece formally annexed Crete in 1913, all but a few of the Cretan Turks had been expelled. ight of 515,000 and the deaths of 288,000 Bulgarian Muslims, nearly all Turks. Only 46% of the Bulgarian Muslims remained. In exchange, 187,000 Bulgarians from what remained in Ottoman Europe went to Bulgaria. ter a failed Muslim revolt against Austrian occupation of Bosnia-Herzegovina in 1881-2.
ey joined together to defeat the Ottomans in the First Balkan War, then fought among themselves for the spoils. Serbia, Montenegro, Greece, and Romania attacked Bulgaria. The Ottomans also attacked Bulgaria to reclaim some land in Europe. ed to Bulgaria from Ottoman race and from the lands conquered by the other Balkan countries. It was the Muslims, however, who most suered. 27% of the Turks of Ottoman Europe died and 18% were surviving refugees. No one counted the numbers lost in the great slaughter and dispossession of Albanians in the West. light. A post-war agreement exchanged the Greeks of Turkey (excepting Istanbul) for the Turks of Greece (excepting Eastern race). 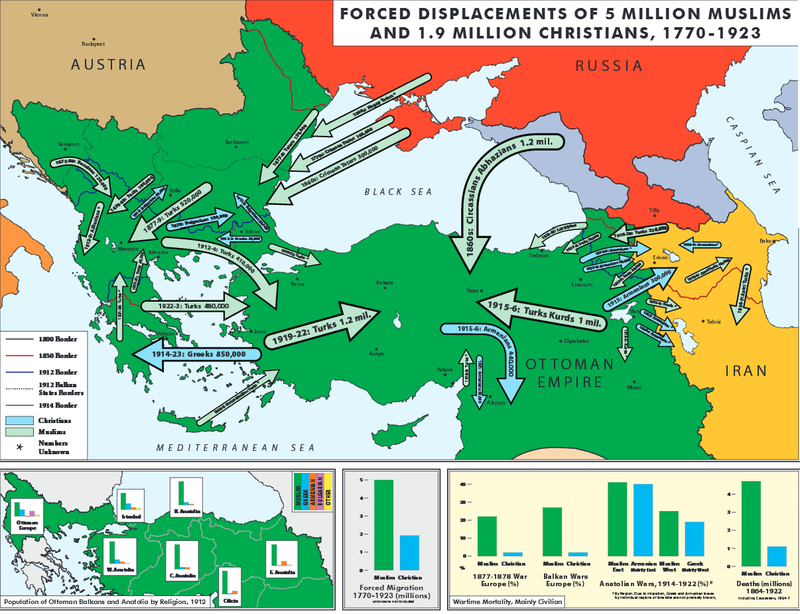 850,000 Greeks were exchanged for 480,000 Turks. 530,000 Turks and 310,000 Greeks had died. ed the Erivan Province (today’s Armenian Republic) in 1827-9. Their place was taken by Armenians from Iran and the Ottoman Empire, drawn by the availability of land taken from the exiled Turkish farmers and Russian promises of freedom from taxes. conquered lands in Northeastern Anatolia, their places taken by 20,000 Armenians from the Ottoman East. fter the Armistice. Armenians, especially those who had been relocated to Syria, moved into the region and attacked the Turks there. Many Turks ed the Armenians and the French. Others began a successful military campaign that drove out the French. e Armenians followed the French retreat. In all, 30,000 Armenians and an unknown number of Turks were refugees. dead family and friends behind in each place, killed by the invaders who drove him from his home. Much the same story could have been told of Greeks or Armenians. ected in the size of arrows. “Anatolian Wars” in the small map of wartime mortality shows the percentage deaths of Muslims, Greeks, and Armenians. Muslim percentages are for the war zones in Eastern and Western Anatolia. Wartime migration, however, makes it impossible to give Armenian and Greek deaths only in the war zones. Those gures are for Anatolia as a whole, but they roughly correspond to the percentages for Muslims. fter 1829 to take the place of expelled Turks and the Greeks and Armenians who went to America seeking a better life. It would have included the Turks who continued to leave the Balkans and Russia up until the end of the twentieth century. It also would have included the great number of all groups who moved in peace time across ever-changing borders to escape persecution or simply to live with their fellows. Had these been included, the map would have been a mass of small arrows.